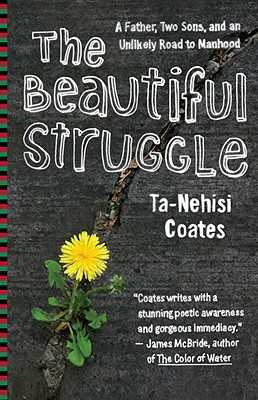 So we're moving along through TNC's The Beautiful Struggle. Chapter 5, like so many places throughout the book, contains these moments where Coates describes his developing "knowledge of self," as folks sometimes call it, which also amounts to readings and thought in black history and culture. "My Consciousness grew," he writes at one point, "until I was obsessed with having been birthed in the wrong year." He even "longer to take the rope for John Brown or snuff the peon who dimed out Vesey." He hung out "at bookstores built for the people" and had Malcolm X's "Ballot or the Bullet" on his Walkman (137). But during school, perhaps bored, he was dismissive and at times disruptive. At one point, after pushing a teacher and then getting handcuffed by police, he receives a serious serious smack-down from his father (141). We can talk about the punishment he receives from his father, but something that stood out to me as it related to the young brother we'll work with next year relates to a bright student (the young Coates) actively engaged with books, music, and ideas out in the world and yet begin disengaged and disruptive in the classroom. I'm not even really sure about the question I have about that right now, but it seems like a topic we'd want to discuss with young black men just starting out in college next fall. Let me know what you think. What other topics from the chapter stood out to you? I think Ch.5 is my favorite chapter thus far. That quote you mentioned above on 137 was CLASSIC to "snuff the peon who dimed out Vesey" I think he had also mentioned (Gabriel) Prosser in an earlier statement or chapter, but I can feel that moment of consciousness and enlightenment because a "few" years back those were the same questions and thoughts in my mind when I was reading about Prosser and Vesey like "Man, who snitched?" (in my Riley Freeman voice)...I digress! Anyway, he speaks of his "chaotic mind" on the following page. "When obsessed, I wanted only what I wanted and could give no attention to other matters." (138) later on as his narrative progresses "In those years, hip-hop saved my life...Hip-Hop gave me a common language, on liberated land, I found that there were other ways of speaking, a mother tongue that, no matter interest, lived in us all." (147) This makes me think of Lupe Fiasco who has song entitled "Hip Hop It Saved My Life" on his last LP, The Cool and it's a very similar tale of the black males from adolescence into manhood...in hip-hop and in the community. The attachement to money and material things brings to mind, a Nietzschien Theory of the "will to power" to overcome the idea of "nothingness" and the Marxist Theory that [self]progression only comes by the ability to produce, to control. Every child in school is not having behavior and attention issues because of ADHD, but society has "taught" us that these are what the problem children look like and that these are their "symptoms". There has to be something else for the young black male, because the classroom isn't enough to hold his mind... it's what he takes rather from the classroom and applies to the realities of his daily life. Angela Davis said it well in her book "The Prison Industrial Complex" that there are many people behind bars who would do well at a higher education institution if given the opportunity...better than some students attending...that society has taught us to be afraid of the black male" and once you become conscious of the origin of that fear, you begin to see things in a different light. That's what signaled the fight between Ta-Nehisi and his father because at that stage he was very non-chalant...he's conscious on some levels, but still hasn't understood the fight: having the Knowledge alone is a danger. It's more than wanting to "snuff" the other person out, you have to be Conscious or aware of what you're fighting for...that's what Bill Sr. wanted Ta-Nehisi to "wake up" and realize because it's a different ball game when the black male becomes a part of the system. It's really something that Coates was picking up all this information about black history and consciousness so early in life, and he was getting outside of school. He writes about doing poorly in his classes, but it's amazing how much solid "education" and access to books that he was receiving at home. His relationship to music may have been typical. But I doubt many people, especially young black boys, had so much access to education and books. It really was remarkable. Yeah, I totally agree which was a point I would have liked to have made..but you say it much better! lol I think that's some of the difference between Coates and other males. He has a concerned father in the home, access to all this book, and in a decent school whereas the other young males like him would have completely isolated upbringings that play into education in the classroom, parental environment, etc.